A cost share agreement for a “green parking lot” at Kessler Mountain Regional Park. The 2018 Community Development Block Grant (CDBG) Action Plan. An ordinance to encourage the construction of more accessory dwelling units. Rezoning 0.35 acres located at 1760 N. Walnut Avenue. Vacating a portion of a utility easement at 237 S. Locust Avenue. A meeting of the Fayetteville City Council began at 5:30 p.m. Tuesday, July 3, 2018 inside room 219 of City Hall, located at 113 W. Mountain St. in Fayetteville. Consent items are approved in a single, all-inclusive vote unless an item is pulled by a council member. 2. Beaver Watershed Alliance Cost Share Agreement (Details): A resolution to approve a cost share agreement with the Beaver Watershed Alliance for grant funding in the amount of $163,000.00 and assistance in designing and constructing a green parking lot at Kessler Mountain Regional Park, with a cash and in-kind match by the city of $140,000.00, and to approve a budget adjustment. 3. Special Events Donation Revenue (Details): A resolution to approve a budget adjustment in the total amount of $23,000.00 representing Fayetteville Advertising & Promotion Commission special event funding, memorial bench program donations from the Rotary Club of Fayetteville and Jimm Garlock, and a donation from the Chain Gang Disc Golf Club. 4. Yvonne Richardson Community Center Garden Shelter Project (Details): A resolution to approve a budget adjustment in the amount of $7,000.00 recognizing park land dedication fees from the southeast park quadrant to be used for the Yvonne Richardson Community Center Garden Shelter Project. 5. Garver, LLC (Details): A resolution to approve a professional engineering services agreement with Garver, LLC in an amount not to exceed $154,000.00 for water tank and water quality evaluations, and to approve a budget adjustment. 6. Allgeier, Martin and Associates, Inc. Agreement No. 1 (Details): A resolution to approve Supplemental Agreement No. 1 with Allgeier, Martin and Associates, Inc. in an amount not to exceed $46,144.00 for additional electrical engineering services associated with an assessment of the city’s potable water stations. 7. Insituform Technologies, LLC Change Order No. 1 (Details): A resolution to approve Change Order No. 1 to the contract with Insituform Technologies, LLC in the amount of $280,192.55 to add additional pipe segments to the 2018 proposed sewer rehabilitation work plan using the cured-in-place pipe method. 8. Watershed Conservation Resource Center Task Order No. 7 (Details): A resolution to approve Task Order No. 7 with the Watershed Conservation Resource Center in the amount of $100,500.00 for continuing native vegetation establishment efforts and minor adjustments within streams to ensure the continued success of completed restoration projects. 9. Lewis Automotive Group (Details): A resolution to authorize the purchase of a 2018 Dodge Ram 1500 4wd Quad Cab from Lewis Automotive Group of Fayetteville, Arkansas in the amount of $22,767.00, pursuant to a state procurement contract, for use by the Police Department. 10. MHC Kenworth (Details): A resolution to authorize the purchase of a 2019 Kenworth T270 cab and chassis with a G & H model 8000 rotating container carrier from MHC Kenworth of Springdale, Arkansas in the amount of $112,313.78, pursuant to the Sourcewell Cooperative Purchasing Contract, for use by the Recycling and Trash Collection Division. 11. Bid # 62123-1802 Grasshopper Construction, LLC (Details): A resolution to award Bid # 62123-1802 and authorize a contract with Grasshopper Construction, LLC in the amount of $22,813.49 for Community Development Block Grant Rehabilitation of an eligible residence located at 1235 S. West Avenue. 12. 2018 Community Development Block Grant Action Plan (Details): A resolution to approve the 2018 Community Development Block Grant (CDBG) Action Plan, to authorize the mayor to execute the CDBG agreement for 2018 in the amount of $668,915.00 when received, and to approve a budget adjustment. 13. Modern Exteriors (Details): A resolution to authorize a contract with Modern Exteriors of Springfield, Inc. in the amount of $23,830.89 for the purchase and installation of sunroom glazing at the Walker Park Senior Activity and Wellness Center using Community Development Block Grant funds. 1. ADM 18-6094 (Amend UDC 164.19/Accessory Dwelling Units) (Details): An ordinance to amend § 164.19 Accessory Dwelling Units of the Unified Development Code to encourage the construction of more accessory dwelling units in Fayetteville. Notes: This item was left on the second reading on June 19. Both the Planning Commission and city staff are in favor of the amendment. One additional parking space (unless the ADU is over 800 square feet). Deed restriction specifying that the owner will reside on the property either in the principal or accessory dwelling. Additional site and landscape plan review. Strengthening requirements to protect privacy of adjacent backyards. Allowing one detached and one attached or interior ADU provided total additional space doesn’t exceed 1,200 square feet. Council members Kinion and Marsh said they’re concerned about increasing occupancy to existing neighborhoods. Marsh said more people means more cars and more noise. Council member Smith said there are means to address excess cars and noise, and this ordinance aims to create more options for affordable housing. The council discussed how many occupants should be allowed in an ADU. There was also a discussion about which direction windows should face in an effort to preserve the privacy of neighboring dwellings, and height restrictions of an ADU. The council discussed alternatives for size limits of ADUs. Smith said he’d like to limit it to a percentage of the overall habitable home size. Marsh said she’d like to keep it at 950 square feet. Marsh suggested sending the proposal to the Ordinance Review Committee. Kinion agreed. Tennant, who chairs the committee, said he’d call a meeting to discuss the issue. This item is scheduled to be discussed by the Ordinance Review Committee later this month. For that reason, it was tabled. 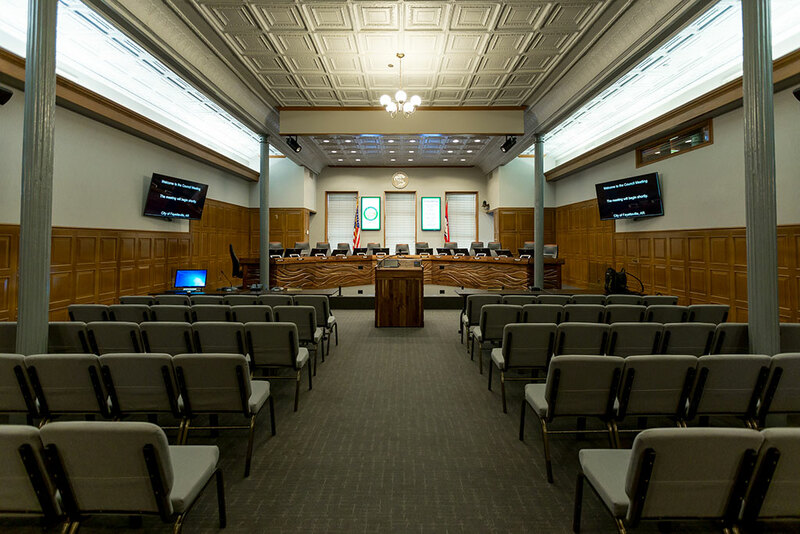 The ordinance will next be discussed at the City Council level on Aug. 7. 2. RZN 18-6206 (1760 N. Walnut Ave./Niederman) (Details): An ordinance to rezone that property described in rezoning petition RZN 18-6206 for approximately 0.35 acres located at 1760 N. Walnut Avenue from RSF-4, Residential Single Family, 4 units per acre to NC, Neighborhood Conservation. Notes: This item was left on the first reading on June 19. The Planning Commission recommends approval of the request. The lot is within the Hillside-Hilltop Overlay District and contains a 1,760-square-foot home built in 1967. This section of Walnut Avenue is a two-lane ‘Collector Street’ that acts as a high-volume east-west connection. The proposed zone would allow the property to be sub-divided into 3 building lots. The proposed zoning is compatible with the surrounding residential land uses, and although this zoning does allow a variety of building types, only single-family dwellings are allowed by right. The proposed zoning allows reduced lot sizes when compared to the surrounding neighborhood, but in staff opinion the change is not so radical as to create an incompatible development pattern. Staff said during the May 29 Planning Commission meeting, multiple property owners spoke in opposition to the request stating that the steep property was not suitable for Neighborhood Conservation zoning and that there are dangerous traffic conditions on adjacent streets that would be compounded by increased density of development. Former council member Kyle Cook spoke against the rezoning. He said he believes in more residential density in Fayetteville, but said not every piece of land should be dense. He said dropping in a Neighborhood Conservation zoning in the middle of an RSF-4 neighborhood could set a bad precedent. Council member Kinion said while NC is good for many properties, it isn’t appropriate for this particular area. He said stormwater runoff is already an issue on this street. Increasing density there, he said, could lead to a bigger runoff problem. Bunch agreed. Marsh said the two zoning districts are very similar. She said with the lot’s close proximity to College Avenue – an area where the council is currently working to increase walkability – she thinks it’s a good reason for increasing density there. 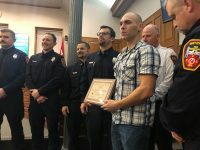 Kinion suggested leaving the item on the first reading and possibly taking a tour of the area before making a decision. Petty agreed. He said NC is very similar to RSF-4, but is more traditional in format because it promotes smaller homes. He said the RSF-4 zoning district can be traced back to the 1970s. Before that, Petty said neighborhoods were zoned more closely in the NC format. Petty said RSF-4 was implemented by Planning Commissioners who were quoted as saying they’d rather have large, luxury homes in neighborhoods instead of small, cheap homes. 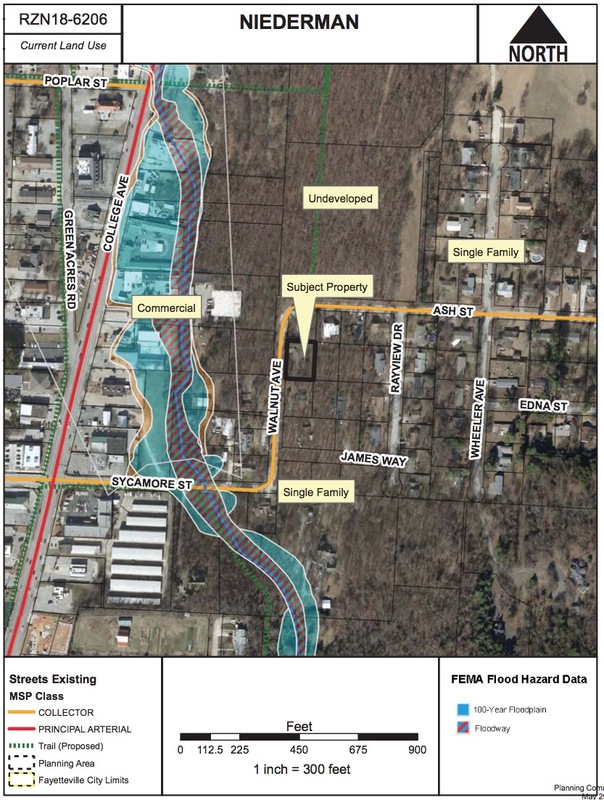 He said he doesn’t blame anyone for living in RSF-4 neighborhoods – after all, people his age grew up in those areas – but said the zoning district was crafted by people who governed the city outside the best interest of the whole of Fayetteville. The property’s 143-foot lot frontage would allow 2 lots under existing zoning and 3 lots under proposed NC zoning. The property is in the Hillside/Hilltop overlay district, which requires a grading permit, tree preservation and retaining walls. The property is on a Collector Street, which requires shared access with safe sight distance for curb cuts. Former council member Kyle Cook spoke again on July 3 and echoed his remarks from June 19. Petty reiterated his comments from June 19 as well, and said the property is only about 800 square feet shy of being eligible for a lot split as it is, so he’ll support the request. Kinion said he can’t see a compelling argument to change the property from RSF-4 considering it’s one piece of land in the middle of an RSF-4 neighborhood. Marsh and Smith said they wish this request had come after the upcoming College Avenue plan. The components of the plan, they said, will likely change the city’s vision for this particular neighborhood because of its proximity to College Avenue and the plan’s expected encouragement of walkability in that area. Bunch said she feels strongly that the property should not be rezoned. She said the topography is too challenging and the sight distance from the curve presents a potential danger. Marsh, Petty, Tennant and Smith voted to send the item to the third reading, but it needed five votes, so the discussion will continue on July 17. 3. VAC 18-6174 (237 S. Locust Ave./Gray) (Details): An ordinance to approve VAC 18-6174 for property located at 237 S. Locust Avenue to vacate a portion of a utility easement and a street right-of-way. Notes: Both the Planning Commission and city staff recommend approval of the request with the following conditions of approval. 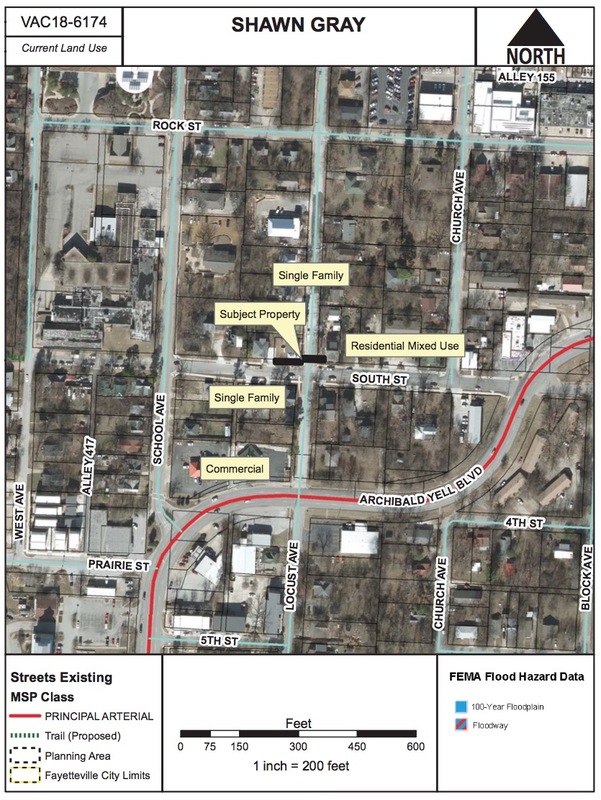 A 10-foot wide utility easement shall remain along Locust Avenue and will be extended approximately 8-feet into the proposed area of vacated right-of-way, matching the new southern property line and right-of-way. Kinion on June 19 said he’s concerned about water runoff in the area, and said he needs more time to consider the request. Mayor Jordan said this property could also be toured before a decision is made. The council toured the property on July 2. There was no discussion on July 3. – The use of fireworks in Fayetteville is legal through July 4, with some exceptions. Click here for details. This meeting was adjourned at 6:18 p.m.